A gentle gallop into Basic Electricity #5 on Friday. This is a take on the patch Tom & I played at BE#4, likened by Ian Boddy to "riding a mutant horse". A Sport Modulator provides both timing information and CVs, driving Maths, a VCO-2RM, Triple Wave Folder, A-112 Sampler/ Delay and VCA-2P panner. The oscillators are FM'd before being gated, folded and sampled. A stepped and manual CV controls the rhythm, delay time and panning. Flipping between track- and sample-and-hold on the SM delivers the final crack of the whip. Less than two weeks to go 'till BE#5 with Franz Schuier, Lu Katavist and Anthony Bisset. Don't miss it! Check the Basic Electricity blog for more info here and here. The Modcan FMVDO is a one-stop FM machine. It offers all you need for stable 2-Operator FM: a carrier, phase-locked modulator, an index VCA and more, all in 12HP. Could this be the gig-able solution I've been looking for? Buy the album for €1 or more to access the full files (14 tracks, 19 mins), including comparisons with the WMD PDO. Although it's more hi-fi, the FMVDO is also prone to mild aliasing. More importantly, the comparison with the PDO shows that its maximum modulation depth is not as deep. At higher indices, the PDO's digital wave-shaper distorts, but this can be tamed whilst still yielding brighter tones. Because the FMVDO's FM takes place internally, you can't increase the modulation above a certain point. The all-in-one nature of the FMVDO raised a few other questions. I'm very particular about my envelope and VCA pairings. If you don't like the internal index-VCA's response, you're stuck. The inclusion of amplitude modulation is a nice feature, but I found this could be a little dirty, depending on the frequency. When active, the internal quantizer ensures that tuning ratios are maintained. It's fantastic to see this included, but I did get the impression that it wasn't always stable. The ability to select waveforms via CV is something I wish the PDO had. On the FMVDO, this can result in radical changes in timbre. The waveforms are well-chosen. Some only reveal their true nature in LFO mode. The secondary output is fixed at 90 degrees. 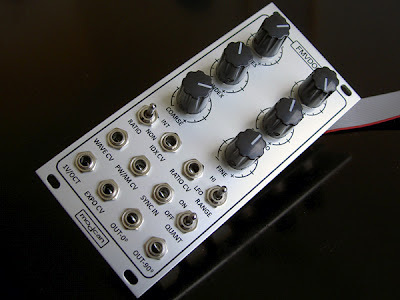 It can be used for stereo effects or quadrature modulation duties. Unlike the PDO, which is based on phase modulation, auto-modulation with this output won't result in wave-shaping. But as you can hear, it does create some wonderfully unpredictable results. The Modcan FMVDO is well built, feature-packed and an excellent source of FM sounds. Sonically, it's 'superior' to the PDO, but I found myself preferring the more robust nature of the WMD. Part of this might be the difference between FM & Phase Modulation. PM is more forgiving of ratio inaccuracies than FM. That's possibly one reason why the FMVDO keeps everything 'in the box'. Make sure you try it out to see whether that suits the way you patch. Derek Holzer & Vanessa Ramos-Velasquez will debut their bioart project A.LIVE at Basic Electricity #6 on September 28th. Completing September's bill is Rotterdam sound sculptor JenaMu6. Visit the Basic Electricity site for more info, flyers, music and video.